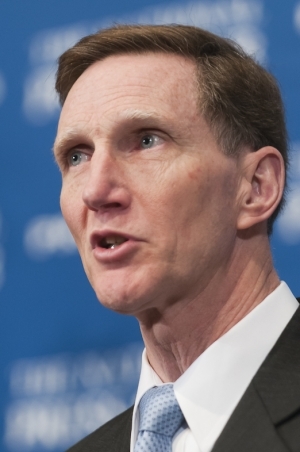 More than a decade after the terrorist attacks of Sept. 11, 2001, people are still trying to bring guns onto airplanes, John Pistole, administrator of the Transportation Security Administration (TSA), told a Luncheon March 5. Over the recent President’s Day weekend, 19 guns were found in carry-on baggage nationwide, Pistole said. It is not believed that any of the people carrying these weapons were doing so with a malicious intent, he added. TSA matches 100 percent of all travelers in the United States against watch lists created by other agencies, Pistole said. TSA also screens all cargo transported on passenger planes domestically and about 90 percent of the cargo on in-bound international flights, he said. The agency is working toward screening 100 percent of in-bound cargo by the end of the year, he added. According to Pistole, the continuing check of baggage for dangerous items is one of the visible security protocols used by TSA to ensure travel safety. The agency continues to review its security protocols to ensure the safety of people and commerce by providing “the most efficient security in the most effective way,” Pistole said. Nine airports are currently participating in the TSA Pre-check Program, which allows passengers to sign up for preflight screening that usually doesn’t require them to remove their shoes and jackets or to remove laptops and liquids from their carry-on baggage, he said. Pistole hopes to expand the program to the nation’s 35 busiest airports by the end of the year. Pre-check is part of TSA’s effort to move to a more “intelligence-directed, risk-based” security system, Pistole said. The pre-check program is an example of TSA’s evolution from a one-size-fits-all approach to a more risk-based approach, Pistole said. “Our ability to find the preverbal needle in the haystack is increased every time we are able to reduce the size of the haystack,” he said. Pistole noted that a passenger  approved for Pre-Check could still be required to complete a normal screening process and that all passengers go through some type of physical screening. Flying is not risk-free, Pistole said. “We are not in the business of eliminating all risk associated with travel from point A to point B. Risk is inherent in virtually everything we do. Our objective is to mitigate risk,” he said. The “multi-layered” security in place at airports today “bears little resemblance” to the system that was in place on 9/11, Pistole said. Another change since 9/11 is the coordination with local law enforcement, which was non-existent and now is routine, Pistole said.